It is both normal and healthy to gain weight during pregnancy. This ensures that both you and your baby are adequately nourished. Weight loss after pregnancy may sometimes be slow and some new mothers can find this initially frustrating. It's very important not to start on a crass diet immediately after you have had your baby. This will lead to health problems and possible post partum depression. Even after pregnancy your body still needs vital nutrients to recuperate and even more so if you are breast feeding. Breastfeeding mothers typically expend an extra 500 calories each day. So don't be tempted to rush things. Your doctor will probably recommend that you avoid strenuous exercise or activity until you have had your six week post partum check up. In fact, until this point in time it is likely that you will not feel much like exercising vigorously. During this initial recovery period walking is a wonderful form of exercise that will not only help improve your health and help you lose weight, but also clear your mind and keep post partum depression at bay. Focus on fruits, vegetables and whole grains. Foods high in fibre - such as fruits, vegetables and whole grains - provide you with many important nutrients while helping you feel full longer. Other nutrient-rich choices include low-fat dairy products, such as skimmed milk, yoghurt and low-fat cheeses. White meat poultry, most fish, beans, and lean cuts of beef and pork are good sources of protein, as well as zinc, iron and B vitamins. Avoid temptation. Surround yourself with foods that are good for you. If junk food poses too much temptation, keep it out of the house. Eat smaller portions. Don't skip meals or limit your intake of fruits and vegetables. You'll miss vital nutrients. Instead, scale back your portions of higher calorie foods. If you're breast-feeding, feed your baby right before you exercise. Wear a supportive bra and comfortable clothing. lStart slowly. Begin with light aerobic activity, such as walking, stationary cycling or swimming. Avoid jumping and jerky, bouncy or jarring motions. Break it up. Exercise in short sessions throughout the day. As your stamina improves, gradually increase the length and intensity of your workouts. Include your baby. Take your baby for a daily walk in a stroller or baby carrier. 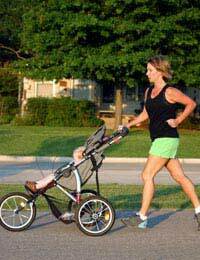 If you prefer to jog, use a jogging stroller designed for infants. Lay your baby next to you while you stretch on the floor. Hold him or her in your arms and dance to your favourite music. Target your abs. Losing abdominal fat takes dietary changes and aerobic exercise, but abdominal crunches and other abdominal exercises can help tone your abdominal muscles. Remember your Kegels. These exercises won't help you lose weight, but they will tone your pelvic floor muscles. Simply tighten your pelvic muscles as if you're stopping your stream of urine. Try it for five seconds at a time, four or five times in a row. You can do Kegels while standing, sitting or lying down - even while breast-feeding your baby.